Does the trace for the subroutine on Executive Functioning need to be successful to do the brain damage? Yes. Interpret the text as if it said "If successful". Executive Functioning (noun): in short, the human mind's capacity to make decisions, form plans, and predict outcomes. In terms of human development, executive functions are formed early on as part of a cognitive suite that allows for the selection of adaptive behaviors that facilitate the attainment of goals and understanding consequences. In the same way, Executive Functioning is best played early on in game as a face-check ICE, being a relatively cheap way to cripple the Runner's cognitive faculties if they are unable to pay through the trace. An early brain damage, and thus reduced hand size, can hamper the Runner's ability to build their rig or protect themselves against further damage. Issues with Executive Functioning can last a lifetime, or at least the runtime of the game. Executive Functioning is best as a 3-off in a deck as you want to draw it early. 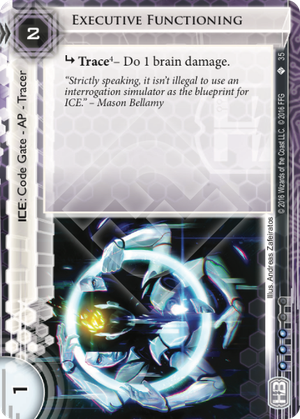 Whether or not you're playing the Terminal Directive campaign, this ICE can be invaluable as a way to tax the runner in various ways with very little initial investment to you. Combos well with brain damage cards like Black Level Clearance, Ryon Knight + Mason Bellamy, Cerebral Overwriter, Defective Brainchips, among others. Not recommended against Runners with lots of , or Yog.0.